If your plan is to head to Michael's before January 8, here are two useful coupons that you can print out and put in your purse before going to the store! These coupons are available at your Michael's between January 2 - 8. During the cold season you would need to have effective medications for pain and fever relief just in case. I would recommend to get Advil even though Advil may be more expensive than, say, Tylenol. Yes, being a more expensive medication compared to competitive brands, Advil is often mentioned as a more efficient way to fight headaches, pains and fever (well, based on my family and friends' opinions!). Again, the comparison is made to Tylenol. When choosing your medication, I would recommend considering the inconveniences of each product. Well, you would also like to be able to save! See the details below. Revlon is now offering 4 new coupons that allow to save up to $11. 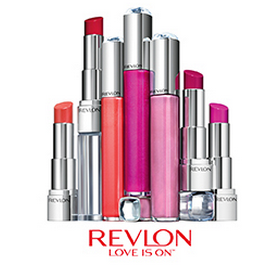 Check these Revlon coupon and order the ones that are appealing to you! See the details below. Who wouldn’t want to get a free gift with a purchase? Yves Rocher Canada can give you three free gifts. Intrigued? Read on! Yves Rocher is offering 3 gifts in December. The 3 free gifts are: a free product, a free foldable bag and a free duo (scarf + bracelet). Special K is now offering 5 new mail-in coupons. 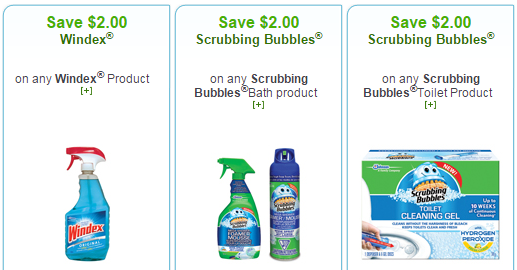 The coupons allow to save up to $21. Order the coupons today and save even more! See the details below. With this coupon you would be able to get a free canister of Tetley tea when you buy two. Savings can go up to $3.50 (cost of a canister). Buy 2 and get 1 free! Print the coupon today. All the details are presented below. 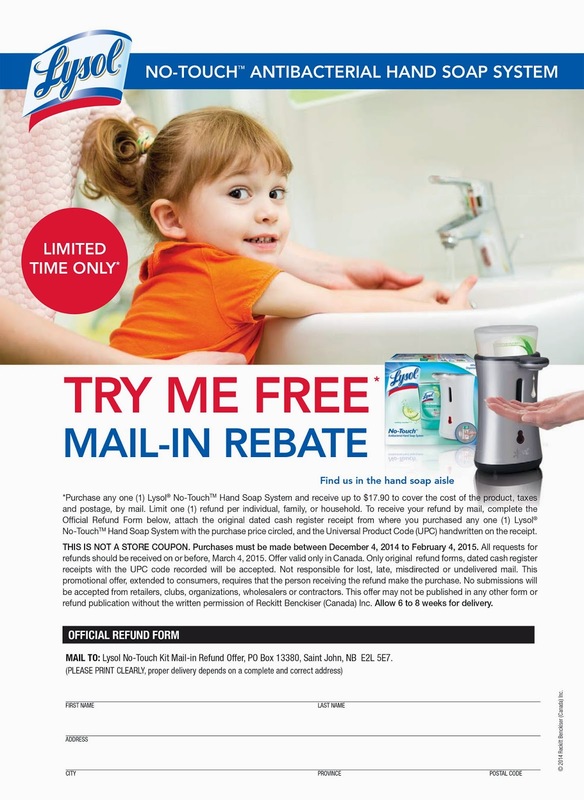 Lysol Canada is offering this in-mail rebate going to up to $17.90 when you try the Lysol No-touch Soap System. When you buy the Lysol system, attach your receipt to the completed form and send it over to the address given in the form. The purchase should be made between December 4, 2014 and February 4, 2015. Oikos, our preferred brand of Greek yogourt, has launched a new contest. 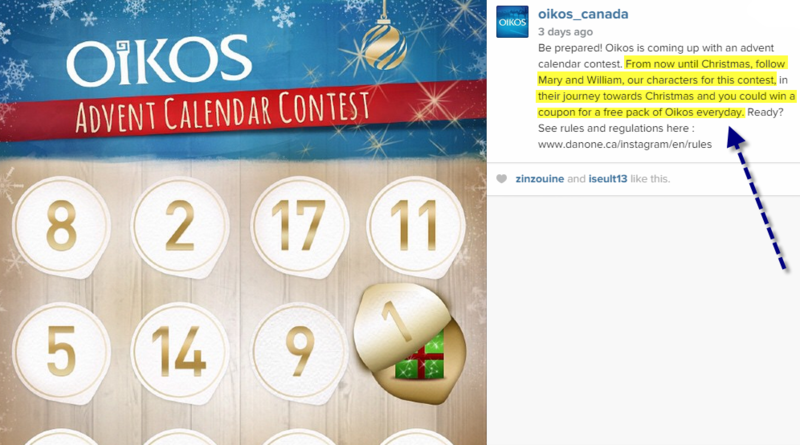 This time around the brand is inviting us to take part in their Instagram contest "Advent Calendar Contest". Tim Hortons is now distributing coupons for free coffees latté. To get your free coffee coupon, you will have to go to this page on Tim Hortons' site and order it. Do you like eating chocolate? I bet the majority of us do! 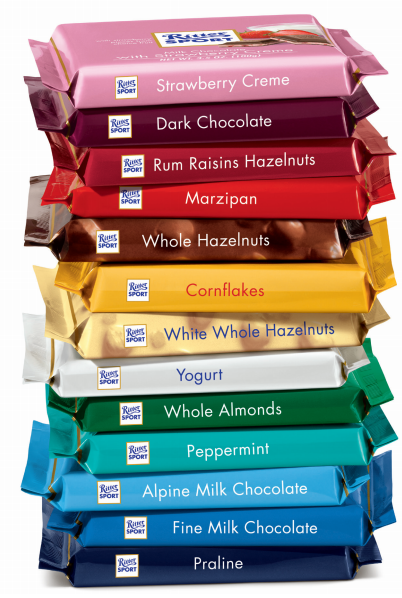 Ritter chocolates cater to this weakness of hours with a multitude of flavours and varieties of chocolate. 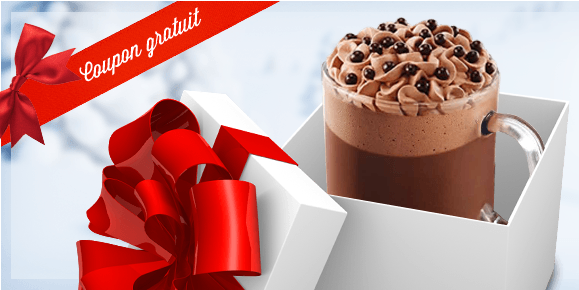 Now Ritter is also offering a $1 coupon valid in Canada through December 31, 2014 (as announced on their Facebook page). The direct link to the coupon can be found below. This week you are going to find a lot of new coupons on SmartSource.ca. All the coupons available on the site are valid all over Canada and are all printable. In our list we've included only those coupons that are highly useful and have a good value. To get to these coupons just click on the respective image below and go to SmartSource to print the coupon out. In our list we've got coupons for these brands: Secret, Gillette, Tide, Downy, Pampers, Cascade, Olay, Clairol, Marcelle, Selsun Blue. Print them away! 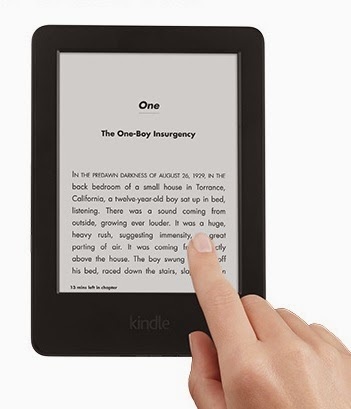 Amazon has become a true market place where merchants can now offer their products and even compete with Amazon's store on Amazon.ca. Therefore, on this Cyber Monday we are going to be able to buy electronics from hundreds of merchants and there will be plenty of products on sale. Discounts will abound with deals going up to 75%. In addition, you get free shipping for all purchases of $25 and plus. What's your regular breakfast? Probably, a bowl of cereals. And probably, Kashi cereals are present in your breakfast bowl from time to time. At least, they are in my bowl. 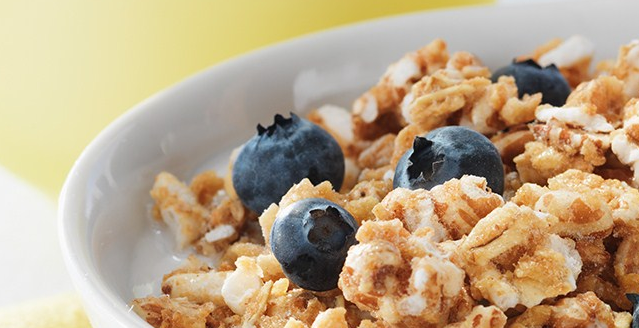 Kashi cereals is something that you may want to have a second look, especially after I tell you about their new product - Kashi Go Lean Crunch (the link to the coupon is found at the end of this post!). Colgate Canada announced a new 1.50$ coupon valid on any Colgate 360 manual toothbrushes. The 1.50$ coupon is available in two formats: in-mail and print on Websaver. 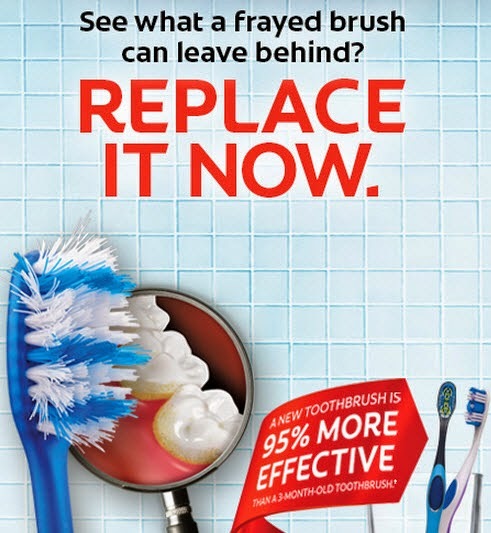 If you are not familiar with the benefits of Colgate 360 toothbrushes, have a peek here. Nivea Canada announced a set of new coupons available on their coupon portal. The new coupons from Nivea allow savings going up to 7$ in total. The coupons are both printable and mail-in. Dynamite, a progressive and fashionable brand of women's clothes, rewards all new subscribers with a 15% discount on all orders made online. 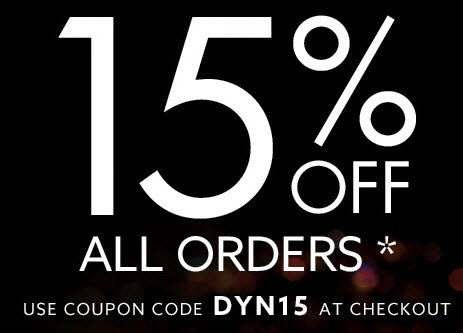 Use the promo code DYN15 at checkout to benefit from the reward. 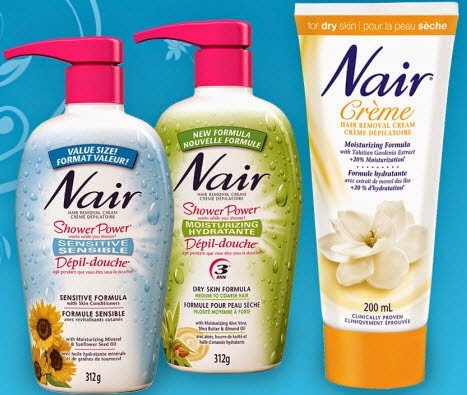 Nair, a brand of beauty products, is now offering a $1.00 coupon allowing you to save on any cream products under the Nair brand. You can check all the creams out first on the Nair site to understand if this is what you'd like to use on yourself. See the link to the coupon below! Indigo Chapters has a number of cool and useful products on sale these days. Check all the discounted products (going up to 50% off) in this section of the Indigo site. You can get home decor products, baby stuff, books and electronics at very attractive prices. The offer is valid while quantities last. 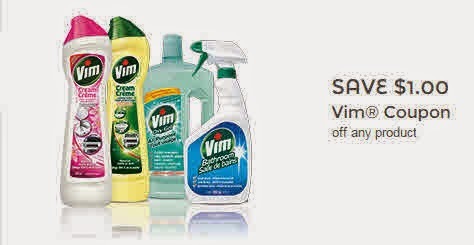 Vim, one of the best must-have brands of cleaning products for home, launched a new coupon - $1 off any Vim products - on Save.ca. Keep your kitchen sink, toilet and bath tube clean and fresh with Vim. Order this Vim coupon today as quantities may be limited.